Blue Mountain Resort, Collingwood, Ont. The 10th anniversary CWS program will explore “Partnering to Innovate in the Blue Economy”. We begin on the afternoon of Wednesday, May 29 with a cross-association industry collaboration session and wrap up shortly after the Women in Water brunch on Friday, May 31. 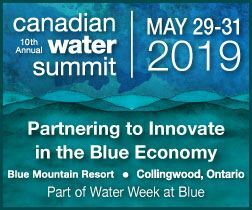 The Canadian Water Summit attracts professionals from water industry groups across all orders of government, manufacturing, industry associations, cleantech, local communities, academia, and NGOs. Since 2009, CWS has grown into Canada’s largest and most diverse annual gathering of business, government, academic, and non-profit water leaders, attracting 300+ attendees each June. Where: Blue Mountain Resort, Collingwood, Ont. Recycling Council of Ontario is hosting a first-of-its-kind Circular Procurement Summit over three days to unite all levels of government, suppliers and vendors and experts from leading jurisdictions to ignite the transition to the circular economy in cities and regions across Canada. 22 Nov 2016 SEMINAR: "Managing Excess Soils"
16 Jul 2015 Webinar "Maximize your Water Resources"
22 Oct 2014 Dairy Policy Reform in Canada and the United States: Protection at Home or International Trade? 25 Sep 2014 2014 Networking Reception: Sustainability Duke Out! 10 Jun 2014 Energy Sustainability Skills Lab: Can Electric Vehicles Work for You? 10 Apr 2014 A&WMA Ontario Section - Waste Management – What is it? What to do with it? 18 Mar 2014 Sustainability: Just an Industry Buzzword? 18 Jun 2013 WORKSHOP: BROWNFIELDS REMEDIATION - "WHAT'S NEXT"
11 Jun 2012 CANADIAN BROWNFIELDS NETWORK'S INAUGURAL TWO-DAY WORKSHOP! 30 Mar 2012 Managing our H20: Are we still treading water? 25 Oct 2011 Sustaining Economic Competitiveness in the Caribbean: "ReThinking Aruba"
06 Jun 2011 VerdeXchange 2011 Canada.